(Bloomberg Opinion) -- The world is littered with startups that have struggled to become genuine challengers to traditional banks despite chalking up plenty of customers. Hong Kong may be different. The city kicked off its virtual banking revolution by issuing three licenses on Thursday, two of which went to ventures led by note-issuing banks. The Hong Kong Monetary Authority is processing five more permits. This second batch is likely to include Tencent Holdings Ltd., Alibaba Group Holding Ltd. affiliate Ant Financial, or even Xiaomi Corp., Chinese behemoths with the heft and technology expertise to disrupt the established order. Virtual banks are similar to conventional operators in being allowed to accept deposits and make loans. The distinguishing feature is that they won’t be expected to set up physical branches. The HKMA included the initiative as part of a fintech push announced in 2017. There are a number of reasons why the virtual pioneers may make headway in Hong Kong. Above all, customers are frustrated with the incumbents. About 59 percent of Hong Kong consumers said they liked their bank, according to an Accenture survey last month of 47,000 people in 28 markets. That compares with 74 percent in the U.S. and a global average of 62 percent. As few as 43 percent in Hong Kong said they had a positive experience when visiting a bank branch. Even in Australia, where the industry is reeling from a string of misconduct scandals, the equivalent figure was 62 percent. Some customers will continue to prefer the comfort and security of visiting a branch. For those that have found the experience less than satisfying, though, the prospect of engaging with a financial services provider solely through a digital interface is likely to appeal. HSBC Holdings Plc, its Hang Seng Bank Ltd. subsidiary, Standard Chartered Plc and BOC Hong Kong Holdings Ltd. held as much as half of the city’s deposits and 40 percent of loans in 2017, according to data from Goldman Sachs Group Inc. StanChart and BOC Hong Kong, an offshore unit of Bank of China Ltd., are partners with firms that received virtual bank licenses; the third went to ZhongAn Online P&C Insurance Co., which is backed by Japan’s SoftBank Group Corp. HSBC has said it’s not planning to apply for a license, preferring to concentrate on developing its existing digital services. As we’ve written, the city’s largest banks should be wary of the virtual onslaught. Hong Kong’s population may be puny, at 7.4 million, but the city is still crucial for their earnings. HSBC got 31 percent of its global revenue from Hong Kong last year; the territory accounted for 25 percent of operating income at StanChart. The challenge for the virtual banks will be establishing trust. That means not just attracting customers but keeping them, making cross-selling of products important. On that score, the initial news isn’t good for the BOC Hong Kong and StanChart ventures. The virtual operators won’t be able to access the banks’ customer bases without prior consent from clients, according to the South China Morning Post, meaning they will have to find new users. Would-be virtual disrupters have had no trouble luring depositors in other markets, but have struggled to translate growth into profits. In the U.K., two-year-old Atom Bank Plc more than tripled its assets to 2 billion pounds ($2.6 billion) in the year through April 2018, but paid out more in interest to savers than it received from borrowers, the Financial Times reported. Its pretax loss widened. In the U.S., many consumers have been gun-shy of relying on new lenders since the 2008-2009 financial crisis. Hong Kong is digitally savvy, though, making it potentially fertile territory for fintech operators. 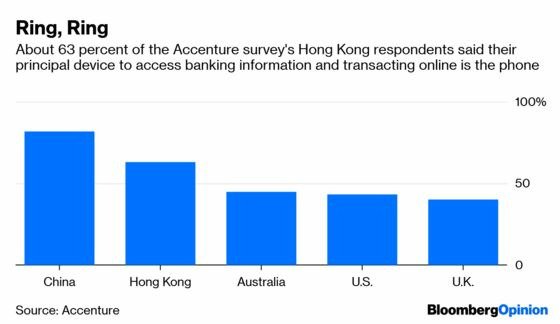 As much as 63 percent of Hong Kong respondents to the Accenture survey said they used their phones to bank online, versus a global average of 54 percent. Elsewhere in the world, incumbents have seen off challengers by copying their business models or even acquiring them. That suggests that BOC Hong Kong and StanChart are right to be getting out in front of the trend. It will take time, but the virtual wave is coming.